On the Scene: MAC Viva Glam VI Launch Party with Cyndi Lauper and Lady Gaga | Fashion. Style. Beauty. | Life is short. Live well. Last night, I attended the announcement of M•A•C Cosmetics’ new spokeswomen for the next Viva Glam campaign and guess who it is? Cyndi Lauper and Lady Gaga! LOVE IT! The fabulous ladies will be the faces of the newest campaign, entitled “From Our Lips,” and it will come out on Feb. 25. 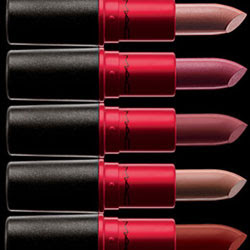 Each star will have their own lipstick and M•A•C Viva Glam Gaga Lipstick and Viva Glam Cyndi Lipstick ($14 each) will be available at your friendly neighborhood MAC counter here in the states on March 18, then globally throughout the month. 100 percent of the proceeds will go to the M•A•C AIDS Fund, which has invested an amazing $150 million since its inception in 1994.